For a gal who likes to talk, I’m not often rendered speechless, but speechless I am when asked to talk about myself. I have sat for days looking at this empty space under “About me” wondering what you’d like to know? Maybe that French Nutella commercials make me cry? Or my favorite color is green? How about I tell you that I love books—the real kind—and the way they smell when they’re brand new? I love people. I sing and pray and cry and worship. I dream and hope and peace fills me. I long to sit with you face-to-face and ask, “What’s your story?” And I would share mine. Without a sound or a word. That might work for the skies, but it won’t work for me. How can you know the content of my character unless I reveal to you my character—or my character reveals itself? One way my character is revealed is through my writing—through my books, this website, stories and articles, love notes in my daughter’s lunch box, emails, handwritten prayers to God, and countless other ways words reveal character in a visible way. Maybe the reason I’m struggling to talk about myself is because alone, I’m nothing. Without God, I’m but a vapor. Without the people He has placed in my life, I’m an empty shell. Relationship makes us who we are. Relationship with Him, relationship with one another. Here are a few memories from some of the people who’ve had a hand in making me who I am. Their stories reveal the content of my character better than I ever could. I love “doing life” with them. Truth is eloquent in its simplicity, yet in its quiet virtue, Emma’s wisdom heals and encourages growth in the most arid of hearts. Her grace abounds, fostering a joyous celebration of a life restored in Christ’s perfection and love. The umbrella may be broken, but with God’s grace it covers wholly and completely. ~~ Giuseppe S.
Have you ever folded a whole load of laundry only to find you had 3 socks left . . . that didn’t have a matching mate? Then you do another load, and there again, you have 2 socks left that aren’t even the same color. Well, in my family, those lonely socks usually end up in a big bag and no one ever takes the time to put them all together. With love and care she took the bag(s) and methodically assorted the socks by color, size and style. There were socks strewn all over the sofas. Then with incredible patience, she found the lost pairs, rolled them up and threw them into the “reunited” bag. Then she told me how she had helped another friend in the same situation. Since then she has called it her “Sock Ministry.” I’m sure she has blessed many more people in this way. Emma taught me that ministry is anything the Lord calls you to do. He gives you the heart, as well as the hands and feet, to go forth and show His love. It’s not just about doing something good for someone, it’s doing it with a servant heart. I often have very bad backaches. One day another friend gave me a hot water bottle. It gave such warm relief and comfort. The next time someone with a backache came to visit, I in turn offered a water bottle. Observing me do this several times, Emma helped me to see that I had begun a “Water Bottle Ministry.” Yes, when God touches your heart, it becomes contagious and you just want to share that love and joy with others. Thanks, Emma, for pointing out that the Lord uses all of us in unique ways to have a special ministry for His glory. ~~L.L. Emma has a heart for homeless people. She is the first person I met who actually stopped, talked, sat down, and shared her lunch with the homeless. She said one man told her sometimes people leave him cans of food with expired consumption dates. This broke her heart. With her background in healthcare, she even cleaned and bandaged this man’s wounds. I’ll never forget Monica. It was in the middle of a particularly cold winter that Monica had made a makeshift shelter in a park. Most people would have ignored her and turned away. Emma stopped to talk to her, and after several visits eventually gained her trust. With Emma’s help, others donated a tent, a sleeping bag and some food. Monica loved chocolate, jam, and anything sweet. We knew her name, a little bit of her story and the fact that she liked drawing because Emma took the time to know her. She took me once to visit Monica. First Emma called her name while still far away to give her enough warning and not startle her. Then she gently repeated her name until Monica slowly unzipped the tent and peeked out. In order to respect her space, we stayed outside and talked for a while, then Emma gave her a bag of food and some paper and pencils to draw with. Monica smiled and was so thankful and offered to draw a picture for us. Despite the signs that she had some mental problems and seemed paranoid, she was talented and had her own charming ways. During that winter, whenever she walked by, Emma would stop to visit Monica. However, one day, she was gone. Emma tried to track her down, but we never found out what happened to her. Monica will always have a special place in my heart. Through Emma, God has shown me that it’s possible to help homeless people, one by one, if you only open the door of your heart. ~~L.L. I have so many memories of Emma: like trucking through Paris with a loaded backpack—that she refused to let me carry. It held our snacks; bread, condiments, plates and silverware that we’d need for lunch; coats and umbrellas, just in case it got cold; nail polish and nail polish remover so we could paint our toes beneath the Paris skies; and our Bibles so we could have a Bible study together. She amazed me with her fortitude, not to mention strength, carrying around that huge bag. But she didn’t mind. It was her idea, and she was happy-go-lucky the entire time, even while climbing the Eiffel Tower. Where did she get the energy? That time in Paris told me a lot about Emma. She’s not a quitter, and she will bend over backwards, upside down, and inside out to make sure someone she loves or cares about has a good time. I’ll never forget when she painted my toenails on that trip! I’d never had anything remotely similar to a pedicure in my life, but imagine getting one in the middle of Paris in an open park, right beneath the stunning, ancient church, the Sacre Cœur. 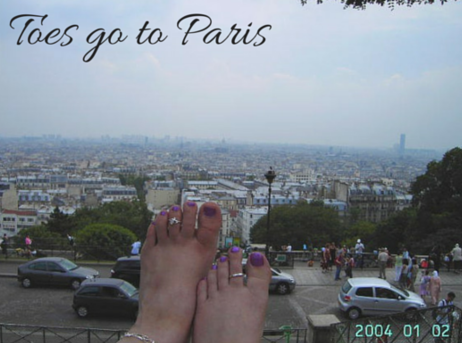 It was that moment we came up with a title for our amazing trip: Toes Go to Paris.